This measures are related with our democratic values. We strongly believe transparency is one of the most effective barrier to stop and to prevent corruption as well to promote exemplary practices among politicians. Moreover, the open source provide, facilitate and empower citizenship to participate, control and monitor politicals organizations with all warranties. Our will has always been to involve people in politics, and one way to achieve that goal is giving freely all the information, in an accessible format to make narrow the collaboration between citizenship and political parties, in order to improve and enrich our the democratic culture and the rationalization and modernization of our political organization and public administration. Applying transparency criteria on Open Data format, not only allow us to save money and cost, but also this financial measure generates methodologies of works that tend to improve internal democracy and makes the decision making more horizontal. This kind of process based on open source tech benefits political autonomy and permit us to control technology from other interest against its wellness and to create knowlegde from civil society to civil society. Additionaly, it supposes a set of activities to allow appropriation to be part of a collective process of a technical system of production. Moreover anyone can use the software to any intention (even comercial), studiying, modifying the software, copying, and sharing without infriging law, and even distributing the improvements throught the same licence. Definetly, using free software is a way to improve our social responsability, transparency and interactivity and a way to make stronger the confidence that we can deposit on technology as a way to contribute to solve the problems society and politics have, and to guarantee the right of access to information, culture, education, etc. • Online voting: This platforms allows the integration of the census of Podemos’s militants with the online voting platform Agora Voting: “Agora Voting is a open code software for online voting that allows any organization to undertake electoral processes in secure, flexible and transparent way at a competitive cost”. 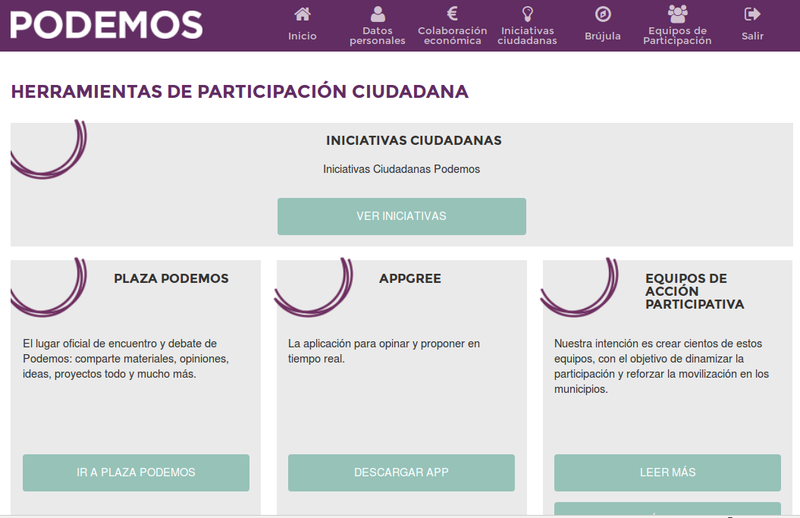 This application facilitates elections in the basis of the location of the user, allowing Podemos to hold local, regional and state level elections. This tool has been use in all 30 votes that Podemos has held. • Financial collaborations: In Podemos, financial contributions are not a required in order to participate in political decisions, allowing anyone to take part actively, independently of her/his economic situation. However, the main source of funding for ordinary expenses are regular donations that people choose to pay monthly, quarterly or annually any amount starting from 5€. The payment system permit payments either via bank debit receipts or with credit card (integrating Redsys payment platform). • Micro-credits: In Spain, electoral expenses are refunded to political organization after their expenses have been reviewed by the Court of Accounts, provided the don’t exceed a given limit. This is the reason why most political parties in Spain are heavily indebted with a few banks, losing their political independency. Podemos has designed a system were anyone can make a loan from 100€ to a maximum of 10,000€ per person that will be returned once the electoral subvention has been paid. This way, Podemos will get in debt only with people, not banks which is forbiden by Podemos’ statutes. • Citizens’ proposals. Podemos gives the possibility to their registered members to push and sign initiatives in the same way legislative proposals work. Participa takes successful proposals fr om Plaza Podemos (hosted in reddit) and display them in the voting area, in +1 bottom-up list, following the requirement of the approved by-laws. • SMS verification. For some massive participation processes it might be required additional security measures, including e-mail and mobile phone identification, thanks to a password sent by SMS. • Blog (Compass): New publishing system. • Newsletter: Sync of users between systems (Participa and Sendy) for the occurences where there might be a lack of consistency between data base. This has been done mainly to discrimate between the users that want to unsusbscribe from the newsletter from those who want to unregister completely from Participa. • Forms and permanent pages: Integration of forms based on WordPress ( Gravity Forms plug-in). • Mobile notifications: It was necessary to build an application in Android capable of sending notifications to mobile devices. It’s an app made with Phonegap. Special thanks are to be given to Leo, Andrés (aLabs), Eric Labuske (responsible for telematic processes at Podemos) and all the people of Participa’s development community. Consolidate accounts with only one click The solution we have been developing has been was a double accounting code taylored to the permissions of each user. This means that in addition to the preceptive accounting code, we use a second field, a long accounting code composed by the regular short accounting code plus 8 other segments that allows us to register additional information about location, consolidation process, type of organization as well categories that help us publish the accounts, including images attached for each invoice and receipt. These segments are completely or partially filled depending on the login of the users. This allows all territorial levels of the political party to work on only ONE database and to consolidate accounts with only one click, while keeping the accounting and budget of each territorial level separated. Moreover, the system of permits is designed in a way in which the users of any given territorial level can review the accounts of their peers, both on the same level or the upper level. This is a central feature of the internal control system, a crossed check supervision that would require that dozens of people in several locations to colude, should they want to commit fraud or ilegal funding. This crossed supervision reduces drastically the possibility of unlawful beheaviours and serves as an internal early warning mechanism. The visualization of the accounts are not yet fully integrated with the accounting system, but the level of detail of the published accounts together with an accounting system that is fully auditable, makes possible citizen’s monitoring and auditing of Podemos accounting, an external control mechanism addtional to the Court of Accounts supervision, making Podemos accounting the most transparent and auditable finances of all existing Spanish political parties. Besides, this system set the basis to have real-time publication of accounts in the mid-term.